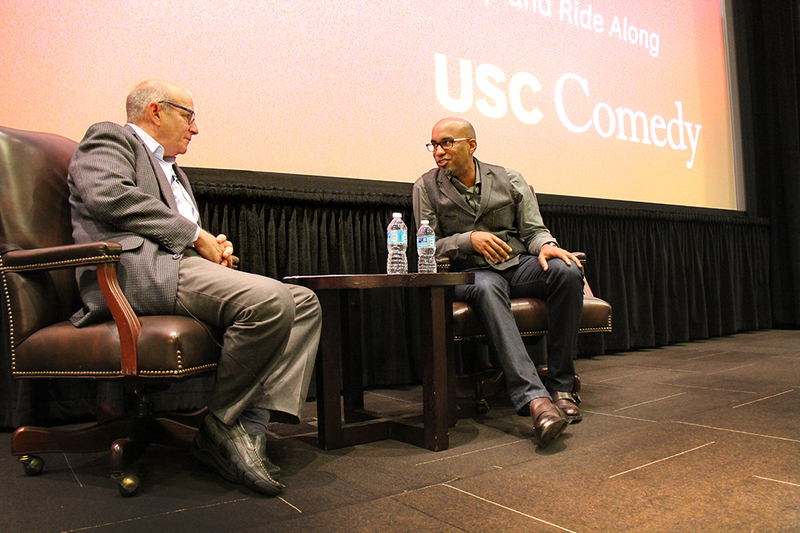 Director Tim Story was on campus on Friday April 15 as the honoree of this year’s Jack Oakie and Victoria Horne Oakie Masters of Comedy Lecture Series. In conversation with School of Cinematic Arts Screenwriting Professor David Isaacs, a co-founder of USC Comedy, Story talked about his work on three movies that have become successful franchises: Barbershop, Think Like A Man and Ride Along (Story also directed the sequels Think Like A Man Too and Ride Along 2). During the discussion, Story also broke down how he designed and filmed important set pieces in Barbershop, Ride Along and Think Like A Man. He pointed out adlibs and told the stories behind some of scenes’ funniest jokes. Often, things that happen on the set or in rehearsals will inform changes and directors have to keep their eyes and ears open for those. Good ideas, he said, can come from anywhere or from anyone, including production assistants who might be on their first professional sets. “You’re looking for those happy mistakes, you’re looking for the things that aren’t on the page and not worrying about where they come from. We once got a joke from the medic on the scene.” His crew also plays a part in discovering the funny. “I always make the point to have the crew around when we do the rehearsals because the first time you do the scene they laugh and if they laugh you know you’ve got something,” he added. Asked how his lifelong approximation to Hollywood helped his career, Story surprised the audience by saying he deliberately avoided the studios until he had honed his skills enough and had actual work to show potential partners. “There would always be people asking, ‘hey do you want me to introduce you to such and such?’ and I would always say no because I knew I didn’t have anything to offer them yet. But I knew that at some point I would.” He knew that if he shot stuff and got better, “it would be a better way to then knock on the door and say ‘hey can you look at this movie?’ as opposed to just saying ‘hey can you help me.’” His approach, he said, was not because he did not appreciate the importance of networking, but because he wanted to make the most of his first impressions. The Masters of Comedy Lecture is an annual event of USC Comedy and the Jack Oakie and Victoria Horne Oakie Foundation, which sponsors scholarships for students interested in pursuing careers in comedic filmmaking. The Oakies were comic actors in the early years of the studio system. Jack Oakie was also a pioneer, successfully launching a long career as an independent performer after his contract with Paramount ended in the mid 1930s. Among his almost ninety films was Charlie Chaplin’s The Great Dictator, for which Oakie’s parody of Italian fascist Benito Mussolini earned him an Oscar nomination for Best Supporting Actor. The Oakie Foundation named a new scholarship in Story’s honor, giving the award a characteristically funny name. The Ride Along with Tim Story Scholarship will benefit a comedy-program directing student at SCA.